Like many companies, at Clariant Creative we operate entirely as virtual teams. This generally works exceptionally well for us, with one glaring challenge: How do you keep everyone on the same page, when you’re not even in the same room? Related Content: Building Your Best Content Marketing Team: How Hungry Is Your Talent? We felt that a great online collaboration tool would be the obvious solution. Choosing that tool, however, proved to be harder than you’d think. The good news is that there are a wealth of tools out there designed specifically to help virtual teams collaborate. The bad news is that there are a wealth of tools out there. Each tool is slightly different, offers varying features and has its own quirks. What I’m looking for doesn’t seem that unusual. I simply need an online collaboration tool that offers exactly what we need, nothing that we don’t, that’s easy to use and that my team gravitates to and integrates into everything they do, all with minimal guidance from me. I haven’t found it yet. Does it even exist? I’ve specified what I like and dislike about each one, along with how we made our final decisions. Looking for an easy way to evaluate these online collaboration tools? Download our free evaluation template! Using this list as my roadmap, I set off in search of the perfect solution. And below, I share with you what I found. This is not an exhaustive list, by any means. And because I feel that my search is not yet over, please – go ahead and give me your suggestions in the Comments section below! This is the collaboration/project management tool we currently use at Clariant Creative. I have a bit of a love/hate relationship with it. But it seems to have given us most of the items on our list, albeit not perfectly. Time tracking is easy to use. Thank you. Task management is robust; tasks can be set up with dependencies, as repeatable tasks, or assigned to multiple people. Great integrations! I can tie Teamwork directly to our HubSpot portal and our Dropbox account, and a nifty Chrome extension lets me add items to our Teamwork account right from any browser window. We can create milestones in our timeline. We can identify risks that might impact our timeframe, which keeps us focused on working around the risk. No way to see at a glance what messages/files/links are associated with a project, unless you look for them. But if you don’t know they’re there, it’s easy to accidentally overlook them. The dashboard is cluttered to the point of being useless, and there’s no way to customize it. There’s no way to open a document within the system; you have to download the document to your computer each time you open it, make changes, save the changes to your computer, and then re-upload the document to Teamwork. All billing must take place from within a project, which is annoying if I want to bill a team member’s time across multiple projects. It’s very easy to forget to check “notify by email” when I’m setting up a task for a team member. Requires multiple steps to mark a project “completed”. Calendar only shows that something is scheduled for a particular date, but shows no helpful details. The time tracking, task management and integrations ultimately tilted us in favor of using Teamwork. But I’ve got enough complaints about Teamwork that we’d switch if something better came along. We struggled along with Teamwork for about a year. But although Teamwork is great for task management, we found it's not fantastic at project management. Managing editorial calendars is a large part of what we do as an inbound marketing agency, which means we need to see at a glance the status of multiple projects at any point in time. Teamwork's clunky user interface doesn't do this well. Trello, on the other hand, does. The simplicity of Trello's user view initially turned me off, but it's turned out to be exactly what we need. As a result, we've moved our agency onto Trello, integrated it with DropBox and Harvest (a fantastic time tracking app), and are much, much happier as a result. 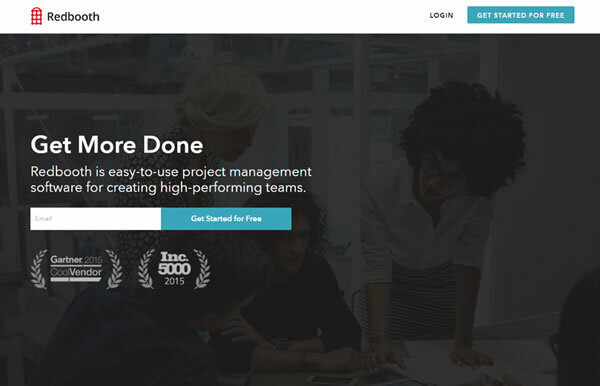 Basecamp is a major player in the world of project management software. Its latest version, Basecamp 3, is pretty darn slick and came in a close second place for us. 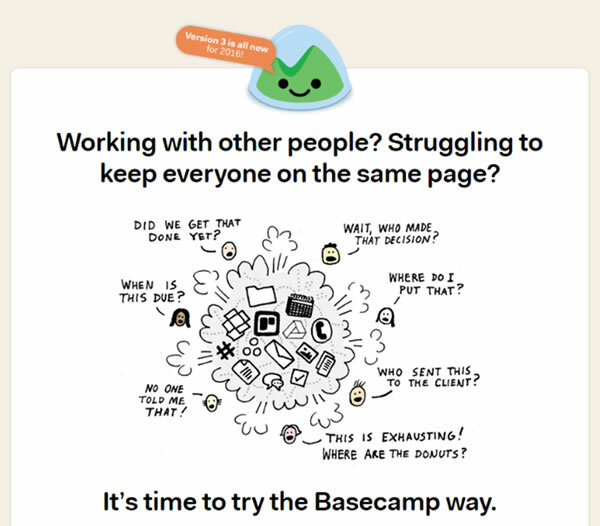 As they say on their own website, Basecamp is world-famously-easy-to-use. The dashboard view is fantastic and everything is easy to find. Automated “check-ins” keeps everyone in touch on a regular basis. I love that this is automated – set it and forget it. The centralized schedule lets you easily see deadlines and milestones. Easy to see the documents stored in the system. Search functionality lets you find anything you need, quickly. No time tracking, only time logging. Expensive – $79/month if we want to use Basecamp with our clients (which we would). This was a very close decision, but the price tag and the lack of time tracking were stoppers for us. Another near-ubiquitous application for creative teams. Even my three high schoolers use Google Docs to collaborate on team projects! Simplifies document storage for our virtual team by saving all documents on the cloud. 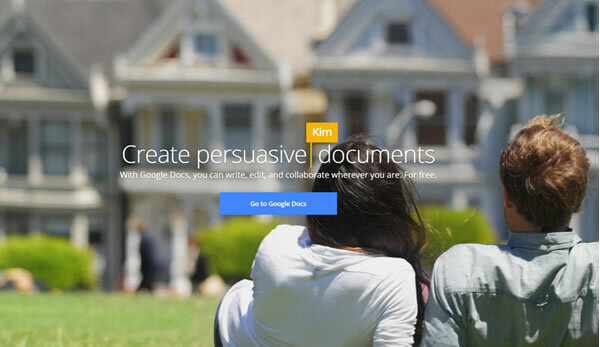 Best document collaboration tool on the market. Multiple people can even work on the same document at the same time, with all changes visible to everyone. Like a dumbed-down version of Word; lacks important formatting features we like to be able to use. Can’t use with Track Changes or Comments, which is very important for clients to share their feedback with us. Have to set up a Gmail account to open a Google Docs account. No project management; this is a document collaboration tool only. Google and Microsoft products don’t always play well together. Given that so many of our clients use Microsoft products, this can be problematic for us. I’d be remiss if I didn’t include the tool du jour that everyone’s talking about. Slack is essentially an online chat tool on steroids, with some interesting functionality that makes it so much more than just chat. No project/task management or really any bells and whistles. 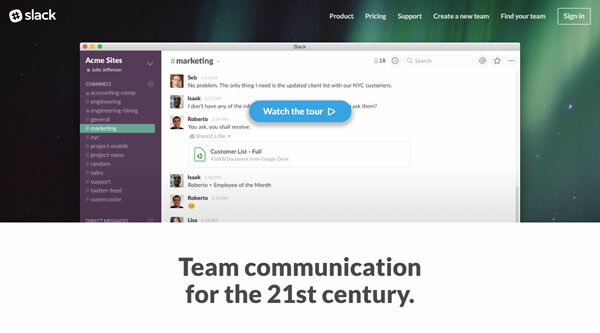 Slack seems to be a great tool for teams that need to be in constant communication. That is not a need for our team. I see Slack as a lateral move from email, not a significant improvement over email. It’s a very minimalistic, visual approach to project management, which has a certain appeal. You can add a calendar view or use the iCal feed in your own calendar app. You can create teams, which are groups of people and boards, to keep things more organized. You can create boards and comments via email, as well as reply to comments via email, without ever opening a browser window. With the free account you can create unlimited boards, cards and teams, and add as many people as you need, which is nice. The free account also includes integrations with Dropbox, Box and Google Drive. For $8.33/user/month, you gain additional integrations and larger file attachment sizes. Perhaps a little too simplistic for our needs? For example, with no time tracking, our agency would need to layer on another time tracking solution. I’d prefer to keep our tech stack as simple as possible. While I love the visual aspect of Trello, I really want a solution with more stuff. Wrike is pretty much the polar opposite of Trello. It comes packed to the gills with features that are specifically geared toward marketing and creative teams. Wrike has all the standard project/task management tools you expect to see from a robust project management solution, including Gantt charts, timelines, etc. Yes they have time tracking! You can also create templates for recurring projects. Instant messaging for fast communication. Wrike integrates with email, allowing you to translate an email into a task. Wrike also integrates with your calendar app, including Google Calendar, Outlook and iCalendar, so you can synchronize tasks and project milestones. Where Wrike really shines is with online document editing. Wrike integrates with Word, Excel and more, which means you can edit your files online – without needing to download them – and Wrike will auto version your file when you save the changes. Wrike is expensive. There’s a free version with minimal functionality. To get to the basic Professional level, you’ll have to shell out $9.80/user/month – or more to get to the Enterprise level with full functionality. Wrike was probably our next top choice after Basecamp. The online document editing is a strong draw for us and, in my mind, what really sets Wrike apart as a collaboration tool rather than just a project management tool. However, ultimately, I’m cheap. And I’m concerned about the user-friendly issues, which may prevent my team from using it the way we should, which would hurt my ROI. I first learned about Redbooth in a conversation over at Inbound.org where I asked the inbound community for advice on online collaboration tools. Several people spoke up in support of Redbooth, prompting me to add it to my list here. Redbooth is intuitive, easy to use, and never overwhelming. Because it’s so easy to use, it’s great for using with clients – which is a huge plus for an agency like ours. Redbooth even helps you hit the ground running with workspace and task list templates. Integrates HD video conferencing and workspace chat make communication a breeze for remote teams. You can organize projects anyway you want – by week, phase or category. That’s a nice bit of flexibility you don’t see in many other tools. Weak on the document management. Integrates with Dropbox, but you have to attach files to a specific conversation or task. There’s a lot to like here. But without time tracking and unexciting document management, we sadly have to pass. ProofHub was designed specifically for marketing agencies that need to collaborate with both clients and internal team members on documents. The killer component of ProofHub is its – wait for it – proofing tools. Team members can mark up any document (including Word, PDFs and more). Instant versioning allows everyone on the team to see all comments and share feedback. This has the potential to dramatically simplify the revision process for creative documents. Great chat and discussion tools to allow for online brainstorming. Project templates help you get started quickly. You can record time but not track time. Some features are a bit cluttered, like their dashboard and Gantt chart view. I love the proofing capabilities, but the rest of the project management tools didn’t stand out for me as exceptional. Flow focuses on simple, intuitive project management capabilities. Great calendar view lets you see everything you need, all at a glance. Kanban view turns tasks into Pinterest/Trello-like boards that are also easy to see at a glance. When brainstorming ideas in chat, team members can upvote their favorites for instant feedback. File management is more like Slack and Redbooth, where you have to upload the file to a specific conversation or task. A little pricey – $59/month for up to 10 people. Flow doesn’t offer all the same functionality as some of the bigger players in this field, but they’re pricing themselves as if they do. I’d prefer to get more for my money. 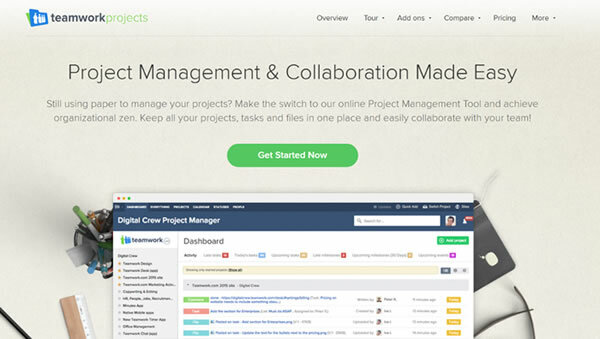 Like ProofHub, Quip is really more of a collaboration tool than a project management tool. 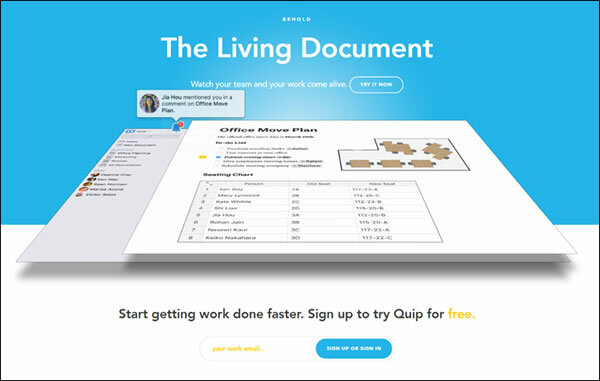 Quip creates what they call “living documents” out of files you import, including Word, Excel, and even email files. Chat is built into each document, allowing team members to collaborate on document revisions easily. No real project management tools. Although I love the collaboration aspect of Quip, there’s just not enough here to make it work for my company. Glip is a bit like Slack with a whole lot more added in, with integrated chat, tasks, file management, calendar views, notes and even video calling. Glip’s project management tools cover all the basics that you’d expect to see. Integrates with a wide number of popular apps so that you can quickly get access to any functionality Glip might be missing. Interesting document collaboration; users can leave comments directly on a file similar to the commenting function on PDFs. All versions are instantly versioned. Uses “@ mentions” to bring users or files into a conversation. Pricing is reasonable at $5/person/month. Interface has a really similar look and feel to Slack, which I just don’t love. Glip feels just a little too similar to Slack for my tastes. 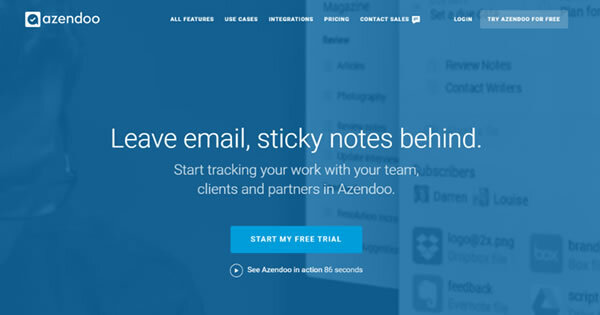 I first learned of Azendoo also on Inbound.org. If you’re looking for a streamlined task management solution, this is for you. Create dependencies with tasks and assign multiple people to tasks. Not a robust file management solution. Not great on other features besides task management. A little too thin on features to make the cut for my agency. I sincerely hope this list helps any other leaders of virtual creative teams out there. And I’d really love to know what other options you’ve all tried that I should look into. Shoot me an email at beth.carter at clariantcreative.com and let me know your thoughts!